RITAMBHARA SAHNI'S BELLY DANCE INSTITUTE MUMBAI talks about how belly dance has been a childhood dream for its students as well as Ritambhara Sahni herself. Posts and stories of how belly dance has been a childhood dream for the students and how Ritambhara Sahni is making them live their dream, is making them continue to dream and helping them fulfill all their dreams in the past, now and future that they have had, have or will have with this mesmerizing art of belly dance. My biggest day when I [ Ritambhara Sahni ] was featured along with my students of Ritambhara Sahni's Institute on the 1st Page of Bombay Times - The cover photo. Belly Dance Institute Mumbai by Ritambhara Sahni has surly come a long way since 2005 but this has been the proudest moment in my life since 1998 ever since i ran Ritambhara Sahni's Institute For the Performing Arts. So in the year 2003,the rains were not happening for a long time and the forecast said as well that the rains would be delayed. We always have the 1st shower towards the end of May but that really dint happen at that time. The May in 2003 was really hot and i would say hotter than its ever been. Everyone was really anxious for the rains to happen soon. News channels were on in every house to know when are the rains going to happen but it was June and still summer at its intense. I was running my institute - Ritambhara Sahni's Institute For The Performing Arts at that time and had done a few elementary belly dance workshops in Mumbai where belly dance was not so popular in that point in time. I received a call from Bombay Times from their photographer and he asked me if i teach Jazz and Contemporary. I did and it was one of my favorite dance forms and so I said 'yes I do' . He said he wanted to do a photo shoot with me and my students. He also asked me how high i could jump and i said i could jump and leap high. He asked me if my students could do the same ? I said - ' yes my students are my reflection and i have made them dance just like me and so yes they can also jump and leap that high. So ...he said ' Great' and he asked me to come with 3 more students of mine on the roof top of Oberois [ Nariman Point ] and he asked us to come on an empty stomach. We reached there in the early evening and he asked me to demonstrate to him some dance leaps. I showed him various dance leaps and he told me that he wants me to leap high as in i am dancing and praying and reaching out to God in a prayer in the form of a dance leap. He said he wanted me to leap as high as if i am praying to God sincerely and trying to reach out to God in the form of a dance leap but dint tell me what i should pray for. He asked us to stand in a line and said we need to keep jumping and leaping till he gets a picture where all of us look the same and are at the same level . We were like ' WOW' - 'even we would leave to see that happen. Usually when you practice several times for a performance and you keep leaping together, eventually everyone understands each other to look alike and reach the same level but here we had not practiced this leap together. Si , i told my girls that consider the 1st few rounds of leaps as understanding each other and adjusting with one another to look alike. I also told them not to be nervous and jump and leap as high as they could initially. I also made them warm up and then told them that this is going to be just amazing. So, the photographer was ready and he was sitting and ready to click us from an angel at the floor level looking upwards. I gave the count and we jumped. the photographer said ...'No girls - Go higher !!' hahahahaahah...the fun had just begun. after several leaps [ over 50 leaps atleast ] - he got us at one level and to his desired height . We asked him on which page would this come and why would we appear in the papers - he said we would be on the 1st page of Bombay Times - the cover photo - preying to the rain Gods for the rains to come as soon as possible. Oh my gosh...what a beautiful idea and what a privileged it was and I loved his idea and concept and loved the way he directed all of us. This was a great moment. But after the photo shoot i was really worried ...i thought to myself that after this appears in the papers , what if the rains don't really happen soon ? ...as we were not praying for the rains...we dint actually know what we were praying for ??? We were just emoting a prayer in our dance leap . So i called all the girls again and we went in one of the girls building back compound and leaped several times and prayed sincerely for the rains to happen. We did this after 2 days and the next day the 1st shower happened. 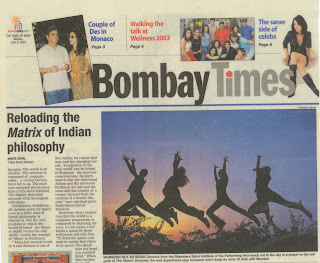 Ritambhara Sahni of Belly Dance Institute Mumbai - Times Of India Article. Indians weddings are well known for songs and dancing rituals.It is an intrinsic part of every wedding celebration in all communities and is full of joy and verve. For Christians, the pre-wedding ceremonies have a lot of folk dancing to traditional music and songs. Gracy Fernandes exclaims "Dancing is the epitome of our wedding celebrations. "On the wedding day the reception begins with the 'Grand March'.It has a quick tempo that sets the mood and gets everyone ready to swing and shake a leg.In this form, the couple and the guest around in pairs.This is followed by the wedding couples first Waltz together and they are then joined by family and friends.Ballroom dancing continues througout the evening and winds up with lively free style folk dancing. Framroz Ghaswala, a Parsi from Mumbai informs. 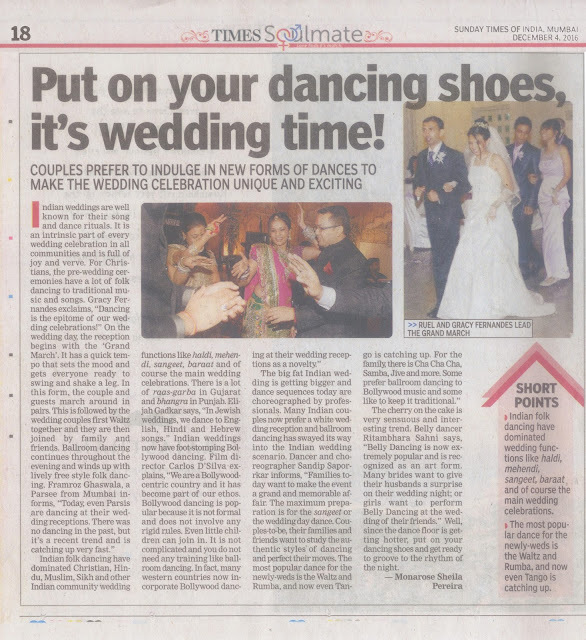 "Today,even Parsis are dancing at their wedding receptions.There was no dancing in the past, but it's a recent trend and is catching up very fast." Indian folk dancing have dominated Christian,Hindu,Muslim,Sikh and other religions.Functions like haldi, mehendi,sangeet,baraat and of course the main wedding celebrations.There is a lot of raas-garba in gujarat and bhangra in punjab. Elijash Gadkar says,"In Jewish weddings, we dance to English,Hindi and Hebrew songs." Indian weddings now have foot stomping Bollywood dancing.Film director Carlos D'silva explains,"We are Bollywood centric country and it has become part of our ethos. Bollywood dancing is popular because it is not formal and does not involve any rigid rules.Even little children can join in. It is not complicated and you do not need any training like ballroom dancing.In fact,many western countries now incorporate Bollywood dancing at their wedding receptions as a novelty." The big fat Indian wedding is getting bigger and dance sequences today are choreographed by professionals.Many Indian couples now prefer a white wedding reception and ballroom dancing has swayed its way into the Indian wedding scenario.Dancer and choreographer Sandip Saporrkar informs,"Families today want to make the event a grand and memorable affair.The maximum preparation is for the sangeet or the wedding day dance.Couples-to-be,their families and friends want to study the authentic styles of dancing and perfect their moves.The most popular dance for the newly-weds is the Waltz and Rumba,and now even Tango i catching up.For the family,there is Cha Cha Cha,Samba,Jive and more.Some prefer ballroom dancing to bollywood music and some like to keep it traditional." The cherry on the cake is very sensuous and interesting trend.Belly dancer Ritambhara Sahni says, Belly Dancing is now extremely popular and is recognized as an art form.Many brides want to give their husbands a surprise on their wedding night;or girls want to perform Belly Dancing at the wedding of their friends. "Well, since the dance floor is getting hotter, put on your dancing shoes and get ready to groove to the rhythm of the night. dna reader Shivani Patel shimmy's her way across the dance floor. Young Shivani Patel has been yearning to explore a variety of unique dance forms. An enthusiastic dancer, with great precision and movement, Patel couldn't wait to attend her first belly dancing session . Ritambhara Sahni's Belly Dance Institute in Colaba is an ideal place to learn the middle eastern , sensuous dance form that appeals to women of all age groups. " You wont believe it, you'll find women in their 70's attending belly dancing classes!. It has an amazing impact on a woman's mental, physical and emotional well being." Sahni smiles and enumerates upon several variations within this exotic dance form, ' We've 20 levels in belly dancing, solar and lunar belly dancing, the list goes on !" laughs Sahni. Belly Dance is empowering and Ritambhara Sahni and her students and team of instructors at Belly Dance Institute Mumbai love to belly dance with their belly dance belts. The noise of the belly dancing belts makes them want to belly dance all the more. I love my belly dancing belt and none of us can imagine belly dancing without a belly dancing belt.....read more such reviews by clicking the links below :. Belly Dance a Dream a come true in every way at Belly Dance Institute Mumbai by Ritambhara Sahni. So, not only to learn belly dancing is a dream but to dress up like a Belly Dancer too. And of course if you are ready with your belly dancing belt, costume and necessary props then why not perform :) says Ritambhara Sahni and her students at Belly Dance Institute Mumbai. Today we talk about 2 Types of Belly Dance Belts that look great to Perform according to me - Ritambhara Sahni..and the inputs from my belly dance teachers and gurus. When we perform on stage, the music is so loud that the effect of belly dancing cannot be felt by the noise of the belly dancing belt / hip scarf but by the effect it creates or how the belt appears on the costumes. We will be talking about Belly Dance Belts, Scarves , Costumes and Props in our following posts to come as well but today we are going to talk about 2 belly dancing belts that create a great effect when you perform. These belts hardly make the noise which makes you feel good while learning as that makes you connect with the beautiful dance art. However these coin belts look great on costumes and create some amount of jingle as well. They are usually available in Gold and Silver coins. And just that metal belly dance belt on any color of the costume will make the costume and the color stand out. We at belly dance institute Mumbai by Ritambhara Sahni recommend that these coin belts should not be worn to learn as they do not let you connect with the dance art as they make very little noise on the shimmy and other techniques but are great on costumes.We believe that when your belly dance belts make noise , you connect more with the dance art. This is our belief . Fringe Belly Dance Belts look Beautiful on casual wear and costume wear but do not make any noise. The effect they create when you move is amazing to the eyes of the audience. A great belly dance belt to be worn on stage to perform as the effect looks bewildering. The effect they create when you turn and sway your hips left and right is just amazing. These belly dance belts - fringe belts are available in gold and silver metal. 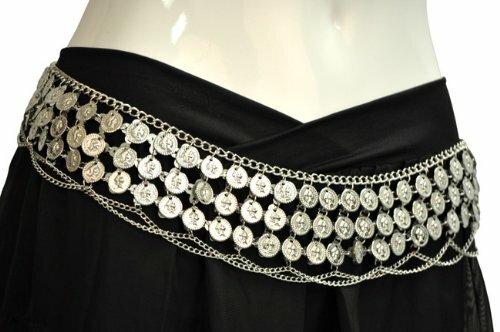 Again we at belly dance institute Mumbai by Ritambhara Sahni recommend that you do not wear this to learn but definitely use this belly dance belt to perform because it makes no noise and i , Ritambhara Sahni believe that the noise of the belly dancing belt helps you to connect with the dance art. Have felt and learnt this from my belly dance teachers as well. 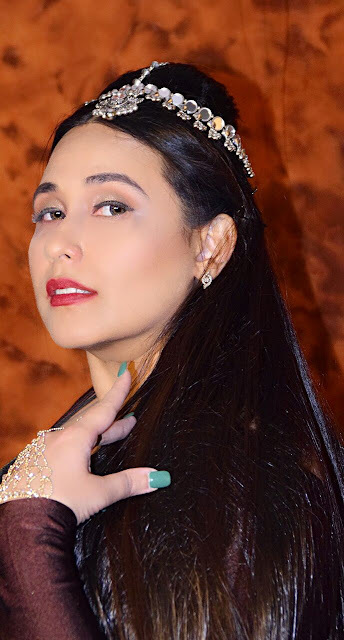 To know more about me - Ritambhara Sahni and My institute - Belly Dance Institute Mumbai by Ritambhara Sahni - Do Click on the following links. Centers at Colaba, Bandra West, Khar West and Andheri. 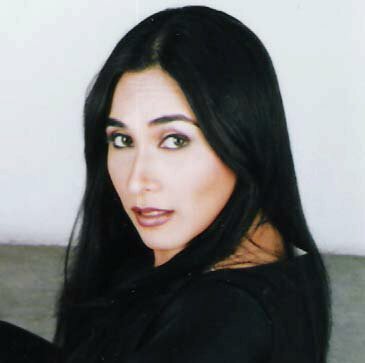 About Me - Ritambhara Sahni and my articles written by me and articles written about me. Belly Dance Institute Mumbai - Centers at Colaba, Bandra , Khar and Andheri.